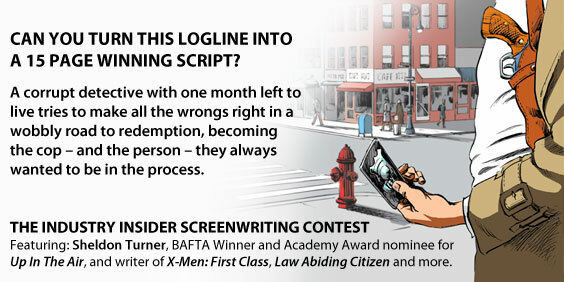 Sign up for a free download of Industry Insider Screenwriting Contest featuring Sheldon Turner Finalist Entries now! Download the finalist’s entries from the Industry Insider Screenwriting Contest featuring Sheldon Turner now! A corrupt detective with one month left to live tries to make all the wrongs right in a wobbly road to redemption, becoming the cop – and the person – they always wanted to be in the process. Congratulations to Patrick Curran, winner of the Industry Insider Contest with his script, The Fragile Satisfaction of Us and Them. Paul Macomber - "Cave Junction"
Byron Burton - "Without Hesitation"
Lisa Molusis - "The Devil's Elbow"
Don Sano - "Ghost Dance"
Think you can turn this logline from Sheldon Turner, BAFTA Winner and Academy Award nominee for Up In The Air, and writer of X-Men: First Class, Law Abiding Citizen, The Texas Chainsaw Massacre: The Beginning and The Longest Yard into a killer script? Working from Sheldon Turner's logline, you’re challenged to create up to the first 15 pages of an original script based on the given concept. Make it your own - setting, time period, character's gender, genre… anywhere your imagination takes you. First on the agenda? Lunch with screenwriter Sheldon Turner at Robertson Blvd.’s uber-popular bistro, known for its steady stream of celebs and location near power-agency ICM. The winner will take in some serious knowledge and know-how from Turner, while filling up on the Ivy’s famous nouvelle American cuisine. Screenwriter Sheldon Turner caught his first big break in 2005, when he wrote the screenplay for a remake of the 1974 Burt Reynolds film The Longest Yard. He would also write the screenplay for The Texas Chainsaw Massacre: The Beginning the next year, but the writer's big moment was yet to come, as 2009 brought the chance to adapt the novel Up in the Air for the screen. The resulting film was a massive critical success, earning Turner an Oscar nomination for Best Adapted Screenplay for his efforts. For feedback on your contest submission click on Enter Contest w/ Feedback for an additional $10 fee.